We are located in Santa Ana, California 92705 (Los Angeles Area). We can arrange for pickup with your carrier. Solid and Firm. Words used such as Original, or reproduction, or the style of, or made by. And including a variety of reason. Los Angeles Area (Santa Ana, CA 92705). And is being sold in "as is condition". Words used such as Original, or reproduction, or the style of, or made by. and including a variety of reason. Los Angeles Area (Santa Ana, CA 92705). We are located in Santa Ana, California 92705 (Los Angeles Area). We can arrange for pickup with your carrier. Solid and Firm. Found at the estate of an old Victorian home, I believe this piano stool dates to the late 1800's to early 1900's. It spins to adjust the height and features a carved wood center pole with three ornate wrought Iron legs and a gorgeous needlepoint, cushioned seat with tassels. It adjusts to a height of 19"-24" and the seat measures approximately 13" x 13". Overall a very nice piece that is in beautiful condition. It appears one leg has been reattached as the screw is new and I can see remnants of wood glue. Spinning mechanism works well and it is very sturdy. Please see photos for full description. What a very nice fabric with eagle design. We are open Sat. If you need other options such as second floor or multiple locations you must let us know before we get your quote. SHOWROOM NUMBER 609 261 0602. Los Angeles Area (Santa Ana, CA 92705). Words used such as Original, or reproduction, or the style of, or made by. And including a variety of reason. There is Wear that is usual for its age. This is what gives it it's character and confirms its age. Outlined in Rounded Brass Nail Heads. Gorgeous Bench! We have over 1,000 pieces of furniture. The fabric could use a light cleaning as per picture. SHOWROOM NUMBER 609 261 0602. This saves you considerable cost and will arrive much sooner than freight, however you will have to pick up at the station closest to you. Padded upholstery has original support webbing and original black needlepoint cover with gold accents and white and pink flowers. Base is carved from walnut with fantastic style legs. Center of top has a dip in the center due to age and use. It is Solid and Firm. Words used such as Original, or reproduction, or the style of, or made by. And including a variety of reason. Los Angeles Area (Santa Ana, CA 92705). We are open Sat. If you need other options such as second floor or multiple locations you must let us know before we get your quote. SHOWROOM NUMBER 609 261 0602. Solid and Firm. They may be original, or reproduction, or the style of, or made by. And including a variety of reasons. Los Angeles Area (Santa Ana, CA 92705). FREE Trial! Age: circa 1950. We are open Sat. If you need other options such as second floor or multiple locations you must let us know before we get your quote. SHOWROOM NUMBER 609 261 0602. Can also be used as a piano or organ bench or an accent bench. No defects to bench seat. Has a thick padded seat reupholstered in a updated fabric. 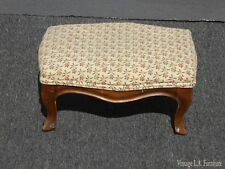 American Empire Rosewood Veneer ottoman footstool footrest Original needlepoint. It has a couple of veneer chips as pictured but solid and needlepoint is crisp and clean.It measures 15"x 9" tall and 12" deep.Shipped with FedEx Ground or FedEx Home Delivery. Can also be used as a piano or organ bench or an accent chair. The seat is 17" wide x 13 3/4" deep and is 17 3/4" from the floor. Made of solid wood with a carved details on the back rest and turned legs. IT IS IN ITS ORIGINAL CONDITION WITH NO REPAIRS. IT IS STURDY AND VERY COMFORTABLE. THIS IS AN "INDUSTRIAL" DESIGN CLASSIC! SEAT ADJUST FROM 18" FROM THE FLOOR UP TO 23.5" MAKING IT USEFUL AS A CHAIR OR STOOL. Ottoman is large enough to use as a conversation seat, bench, ottoman or footstool. This gorgeous piece has legs made from mahogany with carved rams head at the top and padded feet. Gorgeous antique condition. This gorgeous Vanity Bench/Stool is made out of wood, solid wood, veneer, and fabric, and is in good condition. This piece would look equally as marvelous as a seat for a Vanity/Dresser as it would as a great piece of furniture by itself. Antique carved walnut double cane oval vanity bench with removable/reversible upholstered seat cushion. Carved tapered fluted legs. Newer oval removable/reversible 2 1/4" thick seat cushion is upholstered in a light gold brocade fabric. This footstool has a solid wood base the legs are attached to. The wood is all there, no cracks or repairs to it. Nice looking Queen Ann Style legs on the piece as well. No wheels on the legs. Would guess that this piece dates to the early-1900s. Stool has the original needlepoint floral design on maroon background fabricated in the U.S.A. 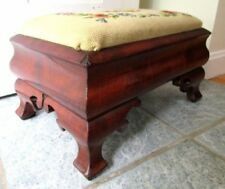 This footstool has classic Victorian Style and design and is upholstered in hand made wool Floral needlepoint tapestry with a maroon background. This beautiful vanity bench is in good condition, it is made out of wood, solid wood, veneer and fabric. The stool has an elegant French style and design. There was a minor professional repair on the design of the stool, but the piece is secure and sturdy, see pictures. Solid and Firm. Overall a Beautiful Bench that will highlight any room it is placed in! They may be original, or reproduction, or the style of, or made by. And including a variety of reasons. With wear usual for its age. Words used such as Original, or reproduction, or the style of, or made by. And including a variety of reason. With Wear that is usual for their age. Solid and Firm. This is what gives it it's character and confirms its age. 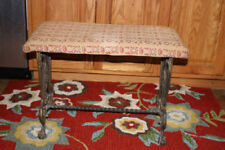 Vintage Louis XV Foot Stool upholstered in old world weavers Scalamandre lapis fabric with hand applied nail heads. The fabric has a few tiny stains and slight rips in the fabric near the nail heads. One leg is slightly loose. But still very stable. I had heavy art books stacked on top. Sold as is in photos. This wonderful bench has a reddish mahogany finish with a beautifully upholstered floral-pattern seat. The condition of the bench is secure and sturdy, perfectly ready to use. WE EXTEND ANTIQUE AND NEW BEDS FROMTWIN/FULL SIZE TOFULL/QUEEN & CALIFORNIA KING SIZE. Bench w Light Green Stripes LAZYBOY. This is what gives it its character and confirms its age. We have over 1,000 pieces of furniture. This saves you considerable cost and will arrive much sooner than freight, however you will have to pick up at the station closest to you. 4-6 weeks depending on your location. SHOWROOM NUMBER 609 261 0602. Gorgeous Ottoman in Great Condition. Solid and Firm. Words used such as Original, or reproduction, or the style of, or made by. And including a variety of reason. Los Angeles Area (Santa Ana, CA 92705). SHOWROOM NUMBER 609 261 0602. Excellent used condition. We are happy to work around your schedule but be aware that this could result in a delay in receiving your order. In all cases, we will do everything we can to get your order to you as soon as possible. 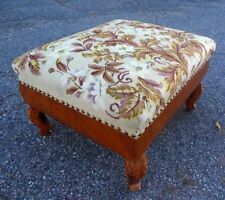 Antique French Louis XVI Style ottoman / footstool, circa 1900. Upholstery in good, serviceable condition, showing faint spots of staining (see photos). They are both tight and sturdy and in very good condition. This saves you considerable cost and will arrive much sooner than freight, however you will have to pick up at the station closest to you. 4-6 weeks depending on your location.